I really love the art and the peaceful music. The cute decorations are wonderful! The alien designs are super rad! The only thing I goofed up was trying to serve the dishes. For some reason I kept forgetting how to do it. For someone so cute... Geez. Thank you! 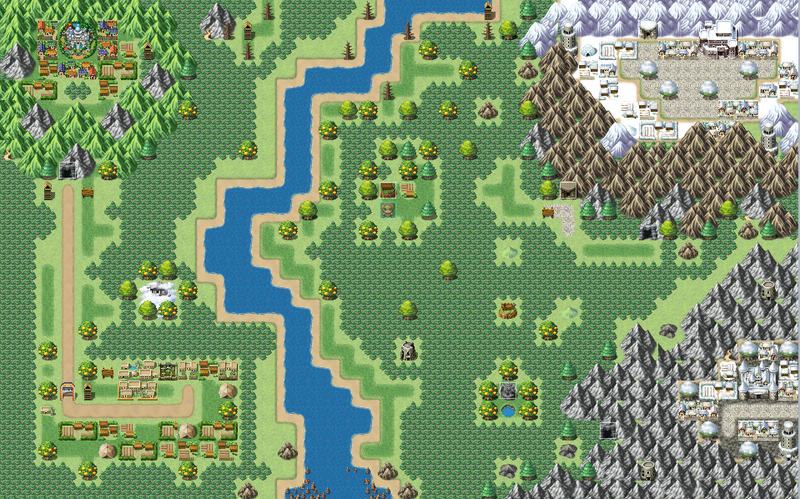 I really love making maps. It isn't really original or anything so I feel kind of lame. The idea of a mysterious spreading darkness is nothing new and I'm not sure if I'm going to subvert anything along the way. I haven't worked out all the details because I knew that if I sat down and wrote it all out and planned I'd have no time left to do the actual game. If I had known about this event sooner I'd have something already written and ready to work with. I'll make a post tomorrow about the story, hopefully it'll work out okay. 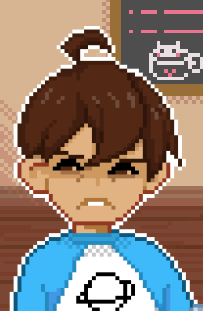 I can't really figure out how to do scenes so I'm getting pretty nervous about the upcoming deadline. Closeups of the different areas of interest. 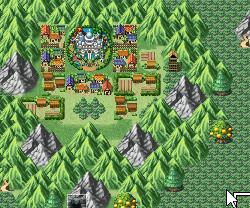 My first version of the overworld map. 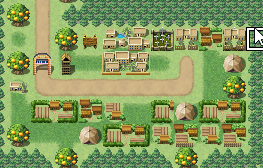 It was really small and cramped but I liked the general locations for things. Here's the current version! More places, more details. 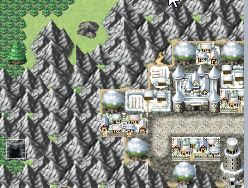 I have a little trouble using the RPGMV tiles, the way they overwrite each other is a little frustrating at times. 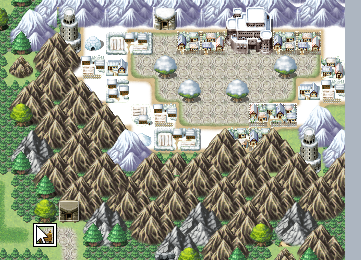 The repetition in the mountains bothers me a bit but it'll have to do- I've gotta work on towns and story! 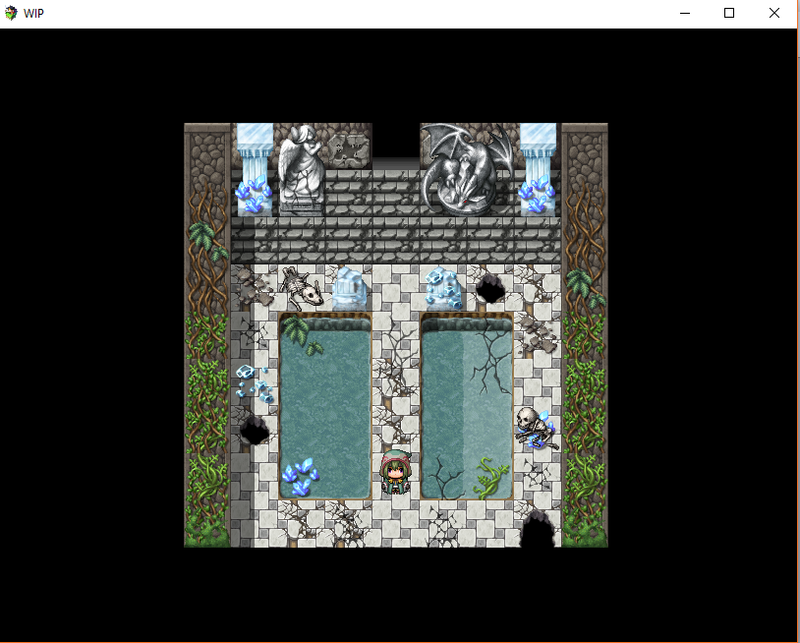 I really like how this room came out. I don't think I'll change it much in the future. I was testing a door to a city I hadn't designed yet... I forgot to put an exit. 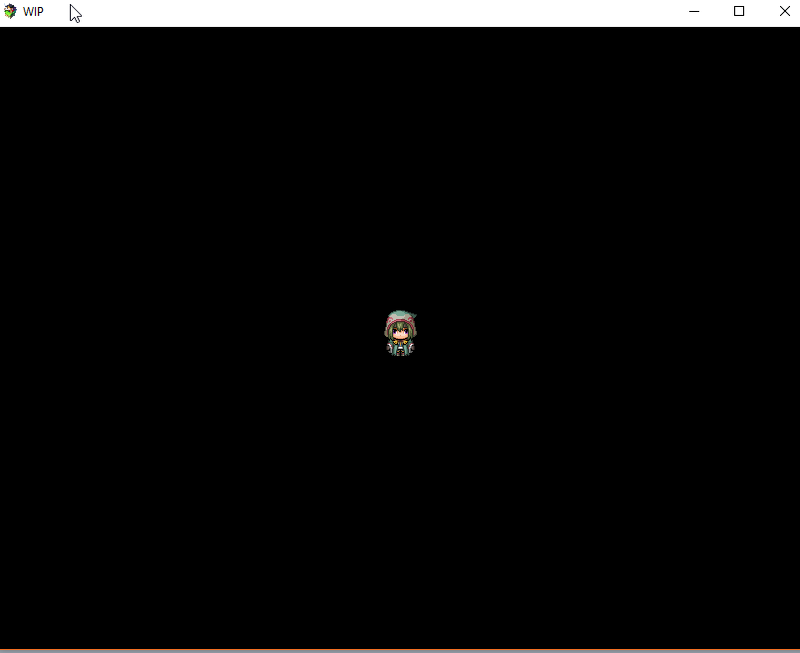 Welcome to the void, new (temporary) character. 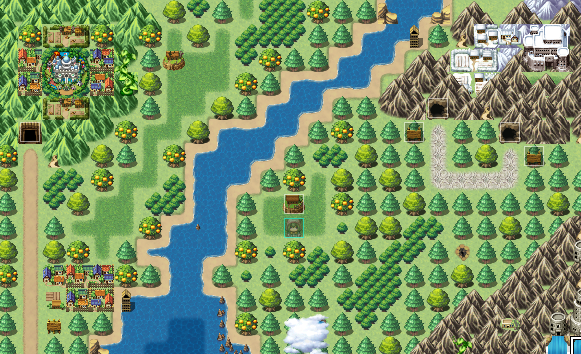 Here's a rough section of map, it's coming along but there's a lot to do still. I've not been able to do as much as I'd like so far, things have been very chaotic. I've posted what little I've done to Twitter rather than here but I'll try and do better about that moving forward. 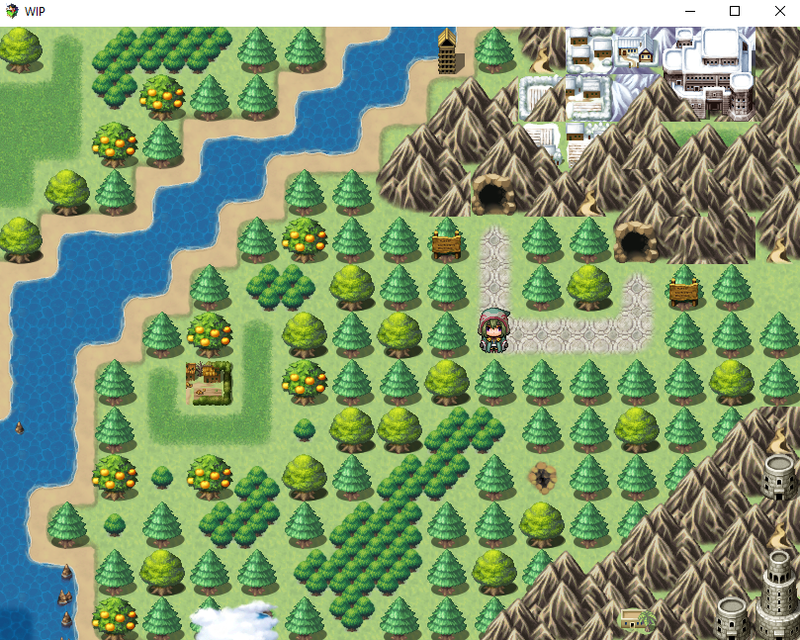 I started off trying out Stencyl (which crashed after my first hour of use, it was a good start lol) but ended up trying out RPG Maker once I realized the free trial was long enough to finish the Jam and it fit what I needed better. 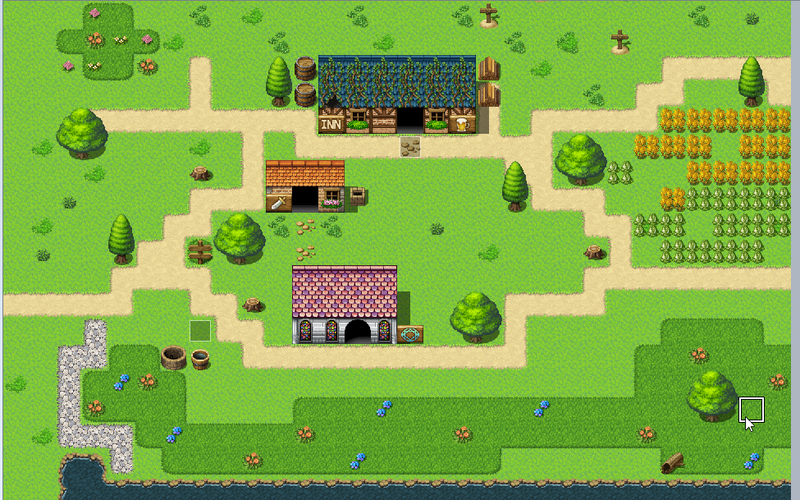 Here's the first RPGM screenshot I have so far, it's just a practice map though. I'm currently watching tutorials so hopefully I'll make something even better by tomorrow night.